So that’s our Orientation over for another year and we are absolutely over the moon with the success of it! This year, our Orientation was held in London South Bank University on June 13th. It was great to see so many excited students meeting for the first time. Time will tell, but I guarantee these ‘strangers’ will be best friends in a few months time – experience has proved this every year! For those who don’t know, our orientation involves a fun filled day of vital information, top tips and expectations of the students’ adventure to America. With over 120 students in attendance, we enjoyed an afternoon of conversation and questions, ironing out any queries or major worries any of our students had. One of BSG’s Alumni, Ellie Cole kindly joined us for the entire day & happily answered any questions that students had in regards to her experience – on all 3 internships she completed with BSG – 3 times I hear you say… Yes, our internships really are that good!! Listed below are the main questions we got asked on the day & some of the tops tips you should find useful. After a few hours of proceeding through the Orientation booklet, we all made our way to Weatherspoons, where all of the students separated into their Country Club groups. Personally, this was the best part of the day as you see so many friendships starting right before your eyes! Rasheeda, Ellie & I mingled with each group, answering questions & watching the students get so excited on each topic we talked about – it really was priceless!! Getting to know and talk with each of the students on such an informal level is so important for BSG and the way Rasheeda runs her business. We have found from previous experiences that it makes the students feel so much more comfortable when talking to us about a worry, query or just in general! After getting to know one another, some students dispersed to get food, but of course the Irish students & ourselves made our way to Charlie Chaplin’s, the only nearby bar which was showing the Republic of Ireland game! We didn’t win, but the 1-1 draw against Sweden kept us happy! Soon after, we met with other Alumni students, Jalessa Wilson, Arthur Gapas and Alice Fletcher who kindly came along to share their own personal experiences about their internships a few years back – thanks for joining us guys, it was a pleasure you have you there. 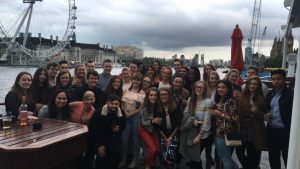 Afterwards, we all made our way to the Tattershell, a boat that is converted into a bar/restaurant on the Thames. As the night drew to a close, the backdrop of the London Eye & many other London sights topped off a truly fantastic day for all! I cannot wait to see this year’s student’s progress and grow over the next 12 months and we are so excited to begin this process all over again in September! Does my health insurance cover me prior to my internship start date? No, you must purchase your own personal health/travel insurance if you are planning to arrive a few days prior to your official start date. Can I fly into any airport? My visa has only been issued for 8 months? Can I stay in my accommodation after my internship ends? Clubs will usually require you to move out of your apartment within 48 hours after you officially finish your internship. Is there anywhere I can keep my passport safe for the duration of the internship? You may buy a safe for your apartment, however, your HR Director at the Club should be more than happy to take care of this for you. How much money should I go to America with? If given the option to buy half a year of insurance, can we opt for this? No, we recommend you purchase the insurance for the entire year. Can I change my mind in regards to the split programme? Can I use the Clubs facilities such as the Golf course? This again depends on the Club that you are placed. Smaller clubs are usually more lenient in offering students to use the facilities. How much is the embassy fee at the moment? ALWAYS carry your documentation in your hand luggage. DO NOT pack your DS2019, I95, passport etc. in your hold luggage – you will be not be able to enter the USA without showing these documents at the airport customs! Reply to your emails – any emails from the Club, BSG or the Visa sponsor are important so please ensure your response is prompt.